My favourite find this week is a 12 inch American Character Doll - Tiny Tears - Pat. No. 2675644, in her original dress. She has tiny 'tear holes' at the inner corner of each eye. She will need some careful cleaning and so far she is waiting, sitting on my dresser. 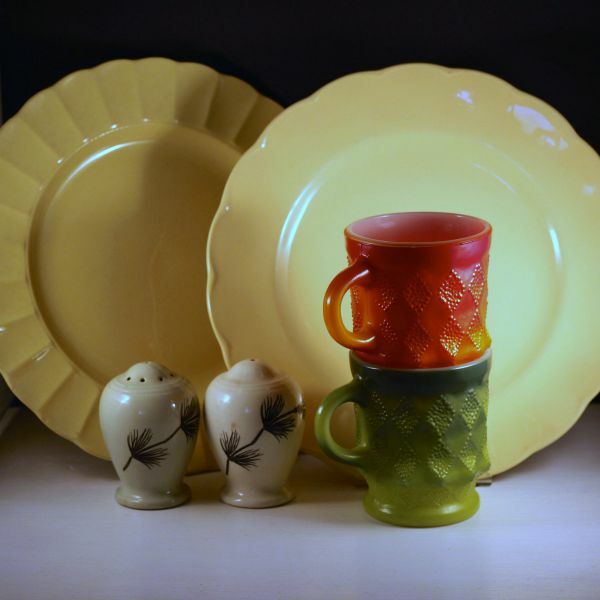 I am always looking for mid-century kitchen, here we have one Morn Glo and one Laburnum dinner plate, a pair of Grindley Salt and Peppers and two Kimberly mugs. 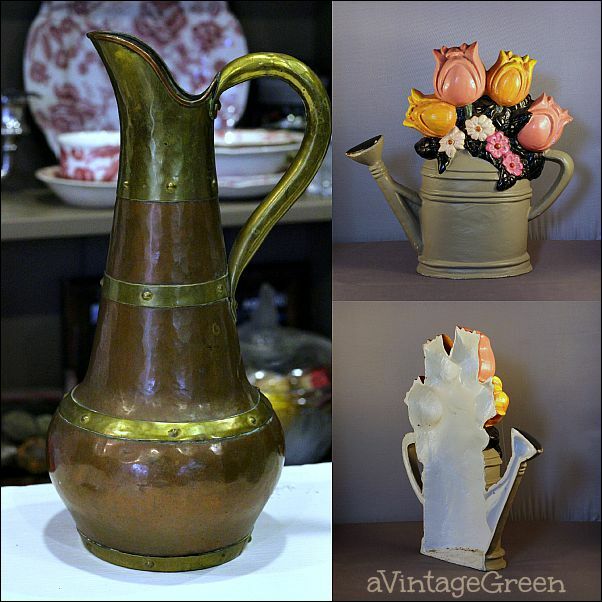 The copper and brass ewer is an original. 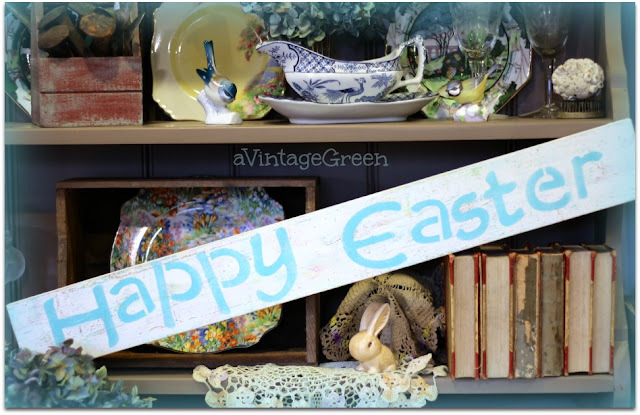 I am not sure about the doorstop, it looks exactly like the original but it seems too perfect so I am guessing it is a repro. It should have wear, rust and not such a clean white interior. 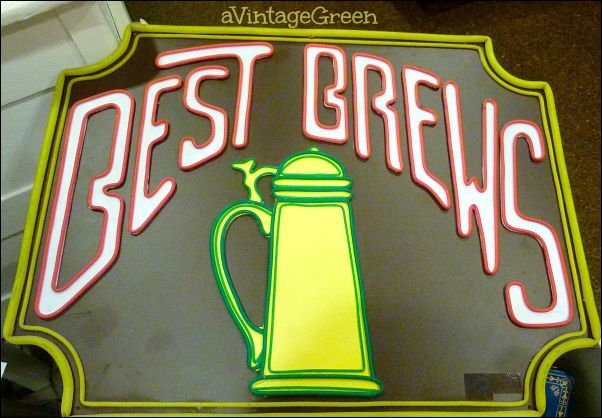 The Best Brews sign is florescent. Bright and happy. 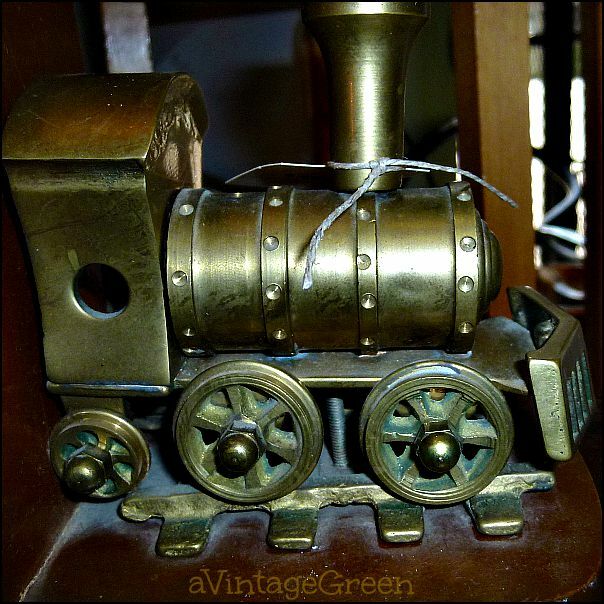 Such great detail in this little brass engine, part of a bookend. Short story. DH was at a garage sale a few weeks ago and saw a wooden tool box. Too heavy to move alone. He had help from 2 young men loading the black tool box into his trunk. Full of very rusty iron tools. I finally this week offloaded the contents into 4 containers and dragged them to the porch. DGS helped the first sort. Files in one box, anything that would drill a hole in another, flat stuff and then other stuff. 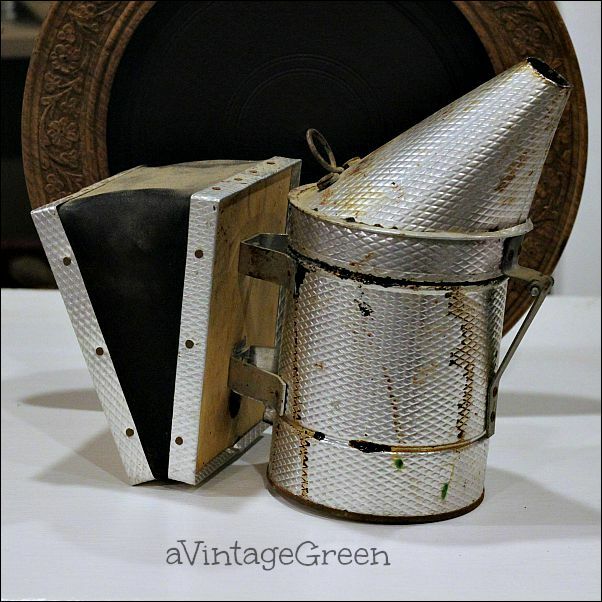 We attacked the brass bits first and pulled out one green handled file and 2 small tins. Polished the brass with steel wool. Easy start to the what to do with all of this stuff. 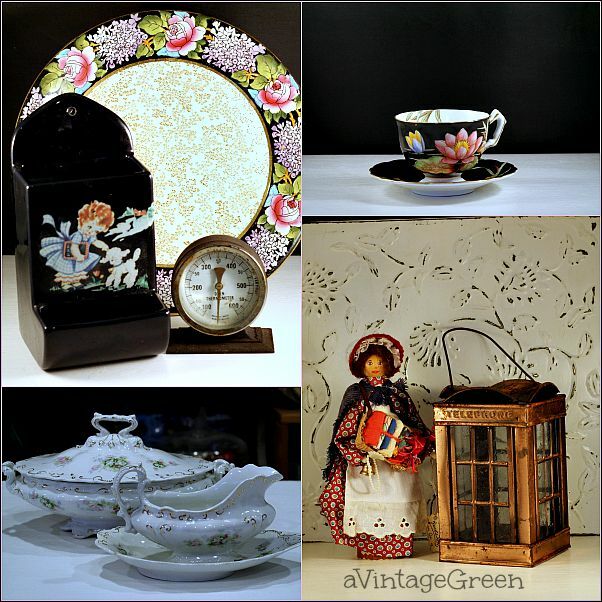 Next up are a Grimwades Winton early Chintz plate, a ceramic faux match box holder and a vintage metal oven thermometer (Brannan, London, England), an Ansley cup and saucer, black with lily pad flowers and then a peddler doll, a copper telephone tealight holder against a faux tin ceiling tile and a Handley covered serving dish and gravy with underplate. and the selections this week were certainly varied. Wow! Great finds! 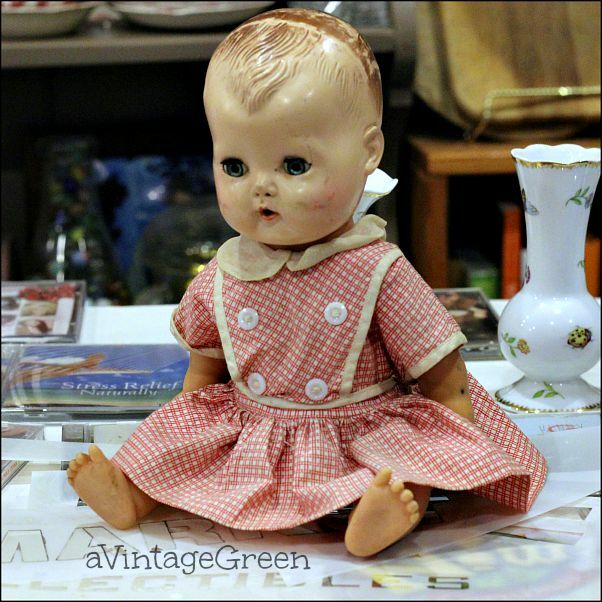 My sister and I had a Tiny Tears doll when we were kids in the 60's. She found one at a yard sale last year. I don't remember it being so small! 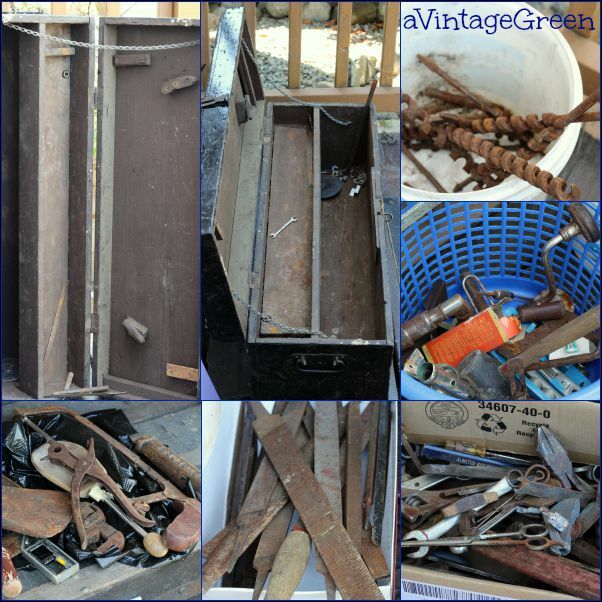 My favorite is the bee smoker, but what I wouldn't give to get my rusty hands on the contents of the tool box! Smoking bees is hard. They keep stinging my lips when I try. Maybe I'm doing it wrong? You do always find the best things. Those tools ought to keep you busy for a while. You found wonderful things. I especially like the doll's dress. 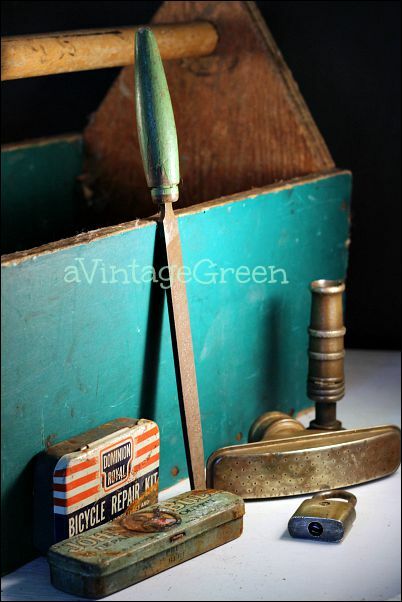 What fun to look through all those old tools! And the Handley dishes are lovely. 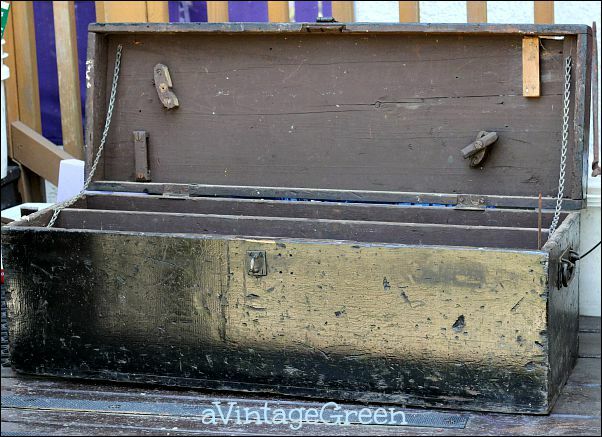 Oh, that tool box and all of it's rusty contents steals my heart! That little doll was probably the "it" toy one year for Christmas. Great finds! Thanks for sharing at Home Sweet Home! I LOVE seeing your finds each week Joy! Your posts truly brighten my day! Thanks for sharing at the Say G'day Party! Pinned and look forward to seeing you on Saturday!